A small man hides from acknowledgement of his failure and irrelevance while dreaming of success and happiness just barely within his reach. 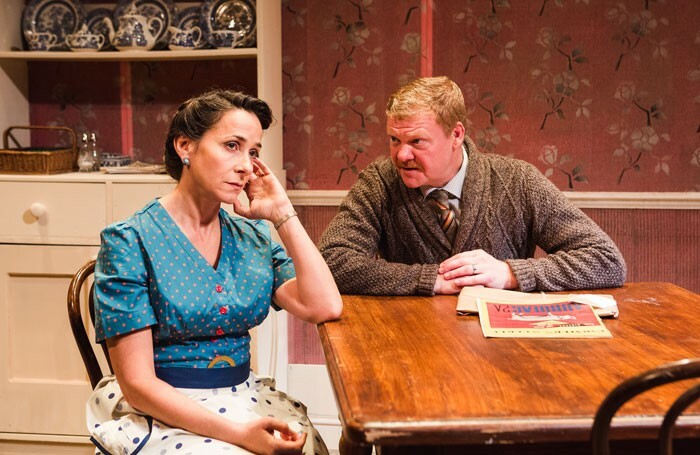 In this, and in the way the man’s reliance on lies infects his children and strains his wife’s determination to be loyal and supportive, Robert Bolt’s 1957 drama inescapably evokes Death of a Salesman. But where Willy Loman is trapped in a fantasy he can’t see beyond, Bolt’s Jim Cherry consciously works at lying to raise himself in his own and his family’s eyes. So here, neither the play nor the protagonist are ever tragic, and not always inspiring of sympathy. Where both the play and Benjamin Whitrow’s production succeed is in creating a solid and believable reality. Even when the characters fall into familiar patterns and cliches – the self-aggrandising fantasist, the long-suffering wife, a girl reaching for sophistication and only achieving sluttishness – these are convincingly the very cliches these small people would slip into. With the strongest performances by the occasionally flamboyant Liam McKenna as Jim and the more restrained Catherine Kanter as his wife, Whitrow (who also plays a small role) finds all the strengths and limitations in Bolt’s script.